If there's anything that Bombay Velvet director Anurag Kashyap has taught us over his last couple of films, it's that he knows how to stage a rousing action sequence. Not only did he create the greatest gangster film of the new century in the epic Gangs of Wasseypur, he also delivered action on a much smaller more concentrated scale in his last film, Ugly. Bombay Velvet also delivers that same well choreographed and shot action that gets the viewer's blood pumping, unfortunately it waits until the last fifteen minutes of a two and a half hour movie to do it. There's so much to be said about Bombay Velvet that I feel a single review would have to march off in a million directions to cover all of the bases with any kind of authority. The most obviously impressive facet of the film is the remarkable staging and art direction. I've never been to Bombay, much less in the late 1960s when the film is set, but the city feels lived in and as authentic as I think it is meant to feel. The titular club is stunning down to the last detail, the period costumes are astoundingly beautiful and well-crafted, the music is gorgeous and suits the surroundings perfectly. However, I can't help but think that all of this was accomplished at a cost that no one expected. Bombay Velvet is the story of Johnny Balraj (Ranbir Kapoor), a small-time hood looking to become a Big Shot in the Bombay underworld. Along the way he makes some enemies, and some friends, and often has a difficult time determining which is which. He falls in love with a girl, the perpetually charming and endearing Anushka Sharma as Rosie, and as with any good love story, his focus splits in a way that forces his tunnel vision to become more diffuse. He seems to find his way, though, when he's taken under the wing of Big Shot Kaizad Khambatta (Karan Johar), and given the keys to a shiny new nightclub that will serve as the home to Bombay's hottest nightlife, but also a front for Khambatta's greasier business deals. After everyone double and triple crosses everyone, turning blackmail into more of a way of life than a crime, things go pear-shaped and Johnny has to decide who he's going to save and then figure out if he can even do it. The intricate plotting of Bombay Velvet and its sprawling twists and turns are surprisingly simple to follow, surely a credit to Kashyap and fellow writers Vasan Bala, Gyan Prakash, and S.Thanikachalam. However, it's not the story or the characters that give me pause, it's the execution that left me scratching my head a bit. This latest work from Kashyap inhabits the space between Gangs of Wasseypur and Ugly in a way that seems only natural. Whereas Wasseypur spread itself out over generations and Ugly took place within a few days, Bombay Velvet takes place over several years. 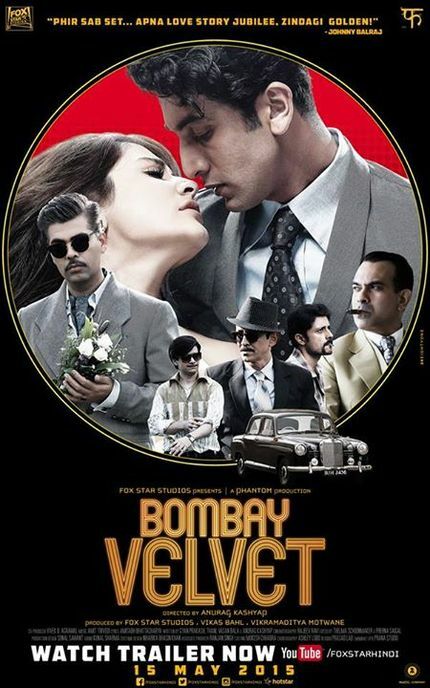 Where Gangs of Wasseypur featured several notable independent working actors and Ugly largely used unrecognizable bit players, Bombay Velvet goes whole hog and brings in some of Bollywood's brightest talents, and not just movie stars, but the best actors among the Bollywood elite with Sharma and Kapoor. The strange part about it is that it doesn't feel like the work of the same director for a lot of the film. There is little to fault in the work of the talent onscreen. Ranbir Kapoor, an actor I've admired since the goofy but heartfelt High-Fidelity styled romantic comedy Bachna Ae Haseeno, plays the hell out of Johnny Balraj. Bollywood gangster stories are a dime a dozen these days, but very few of them feature characters as well-drawn as Balraj. Anushka Sharma has had me hooked since her very first film, Rab Ne Bana Di Jodi, and I'll follow her to the ends of the Earth. Her muted performance as the siren Rosie is perfect for this damaged character with just enough agency to get herself where she needs to be, but not quite enough to keep herself safe. The biggest surprise is obviously the debut of Karan Johar as Khambatta. Johar is a major player behind the camera, as the director of some of Bollywood's greatest love stories of the last 15 years he's a household name in India, but I was genuinely surprised at his ability in this film to inhabit such a sinister character with a charm that seems all too natural. Where Bombay Velvet comes up short for me, and this is a big one in my book, is that it feels clinical and rigid, where Kashyap's films are usually so well paced and fluid. If there is anything that connects Kashyap's recent work it is visceral passion that's impossible to miss on screen. With Bombay Velvet, that propulsive plotting, the incessant drive, the go-go-go that I'm used to is missing. It feels very quiet, even though the outstanding score permeates the film, it doesn't seem to punctuate the action in the way that it should. Perhaps that is what Kashyap was going for, a more contemplative, cerebral film with less of his usual bombast. If that is the case I suppose he's succeeded on his own terms, but it left me cold and wondering what I was supposed to feel. I suppose it isn't really my job to determine if a director succeeded at their goal, though sometimes I like to pretend it is. All I can really do is tell you if I think the film worked for me. If so, why? If not, why not? Bombay Velvet is a strange beast in that regard. This film has moments of greatness, wonderful character moments that help to define the world and pathos of these very flawed humans. Johnny Balraj's penchant for underground bare-knuckle fighting as a way of subduing his inability to deal with his own emotions, for example, was a brilliant touch that tells us a lot about a character without a ton of dialogue. However, the overall execution just feels off. The wild twists and turns hark back to Ugly's treatise on the depressing nature of the human condition, but without the emotional stakes to make me feel anything about the nature of the game everyone is playing. In the end, in spite of several first fights, a couple of explosions, and several brutal face-to-face murders, the only action sequence that really stuck with me and made me feel for these characters was the climax. At that point, though, it was almost too late to grab my interest. Where was this immediacy during the first two thirds of the film? Granted, the climax of the film is supposed to be the most intense part, but it was so far out of proportion with the rest of the experience that I just couldn't place it as part of the same film. This was the film I wish I'd been watching for the entire two and a half hours, sadly, as great as it was, it was too little too late. I just got back from watching the film. I agree with Mr.Hurtado,I enjoyed the film but I wanted it to have more stand offs, guns,brawns and brains..and I could have done with fewer songs. But it's one of the better and memorable films to come out of Bollywood in recent years.